Introduction: A brief introduction about LCCG and plan for the meeting. Committee that has been in place over the previous year introduced to the AGM. Treasurer Report: Full report of in and out goings given out as a hand out. This year’s running total is £210. This money is from membership and donations primarily carried over from the previous year. What are we doing about dangerous side roads/junctions, in particular Newarke Street – Marble Street and Granby Street – Northampton Street? The group continue to push these issues. In a meeting with the Mayor we discussed the dangerous junction on Newarke Street, highlighting the Cities own safety audit which clearly states there is an issue there. We were assured by the Mayor something significant was going to happen, we are still waiting to see what this would be. Given the difficulties in visibility at the location, our request was to block off Marble Street. As a group are we being listened to / taken seriously by decision makers? This is dependent on who we are talking to, some officers are very good and are willing to meet and discuss our thoughts, however some are not. We have a good relationship with the Mayor which helps when we come across a difficult officer and often go straight to the Mayor. Are we being successful with producing consultations to share with our members in the hope they will send more in to increase numbers? (numbers do count in the process) We have always managed to get an LCCG consultation in on time, however when possible we need to share the document earlier with the group so it can be cut and paste by more members as numbers do count. Change the date of the AGM from October to February/March and subsequently change the date for submission of proposed resolutions – no objections, all in agreement. Change the name of the group: our constitution currently says Leicester Cycle Campaign Group, however our bank account says Leicester Cycling Campaign Group. Therefore we propose the constitution be changed to be in line with our bank account – no objections, all in agreement. Both changes are agreed and the constitution is duly amended. Voting procedure for the new committee: There will be slips of paper at the front of the hall for candidates to be proposed and then seconded. 1. Why are you a member? To improve cycle facilities and environment in Leicester City, to counter the car lobby. To represent me in ways and in things that I may not have time to do individually. To gather information, collate and lobby for better cycling facilities – so I can find out infrastructure news from one place instead of several. Because we can achieve so much more together than we can as individuals. It’s really important to me to hear other people’s opinions and experiences as I form my own opinions on things related to cycling. The more members the stronger the mandate the groups has when lobbying. To be part of a bigger group – with lots of expertise, and more hope of achieving things. 2. What do you hope the campaign group will achieve? Joined up continuous, wide, safe cycle lanes throughout the city and feeder routes from within the shire. Leading to greater numbers of people cycling and fewer cars on the road. More cycle friendly (8-80), space all across the city – right out to the edges. Promote the inventors favourite invention for more normalising of bike use for all ages and classes. To encourage planning and services etc to think about cyclists at the planning stage – more joined up. Fix cycle city workshop to be more than just a council PR job. Better cycle facilities on out skirts. Maintain our existing cycle routes, repaint road markings, cut back trees and bushes, fill pot holes, and resurface Forest Way. Car free Sundays – start at DMU, Bede Island, then expand. Bike parking in every city park. Improve/develop Western Road, Wilberforce Road – bike lane and take cyclists off Narborough Road footpath. Open a city centre bike maintenance coffee shop for the unemployed. Close the centre ring to all private cars. 4. What should we do for the elections in May? Stress that we don’t just want to make biking look good on paper, be adventurous get out on your bike – all ages, all classes. I plan to work for Peter Soulsby re – election campaign, so I am biased, but as a group we should publicise our support for the improvements in Leicester over his term, including cycling. Ask all council candidates to tell us their vision / views on cycling in the city and publicise their answers, i.e. 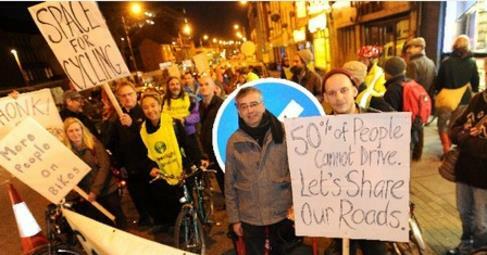 are you in favour of more segregated cycle lanes in the city? Are you in favour of reducing car use in the city? Ask my Councillors to sign the new Bennion Road cycleways. Ask councillors to sign up in support of a cycling manifesto for the city and publicise who has. Support the Mayor but not too obviously. Appointment of new Committee: The constitution allows for up to eight members of the committee. As only seven nominations were received, there was no need for an election. Vote taken, group happy with the seven new committee members, one space is still free. The meeting ended and attendees were encouraged to join Healthy Air Leicester and Leicestershire (the alliance of which LCCG is a member) for the launch of their Healthy Air Manifesto in Orton Square from 1pm.